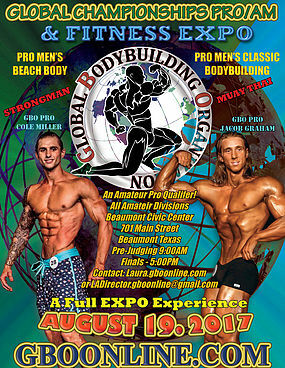 Join me on August 19th for Global Bodybuilding Organization’s Global Championships PRO/AM & Fitness Expo where I’ll be shooting stage photos, behind the scenes photos, video, and a Sunday photo for athletes looking to do a post show photo / video shoot. POST SHOW PHOTO SHOOT: Personalized photo shoot post show to capture your show-ready physique. I’ll be posting gym location and / or local shoot locations for interested athletes. FULL SHOW PACKAGE: Receive a special package price when ordering stage photos, event video, and post show photo shoot.